Cristiano Ronaldo is a goalscoring, trophy-winning machine, who is hungry for more in every match in the colours of Real Madrid or his national team, Portugal. Real Madrid became the first team to win three on the trot, and Ronaldo now has five Champions League medals to show for - four with the Los Blancos, and one with former club, Manchester United. 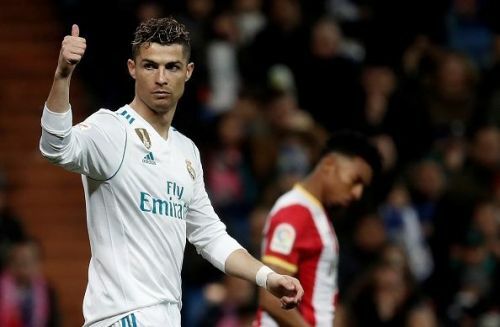 The last season was a somewhat successful one for the Portuguese forward, as he helped Real Madrid to a third consecutive Champions League title - a feat that seemed impossible previously. The star forward has had an incredible duel with Barcelona and Argentina's Lionel Messi over the last decade or so, and it seems like the competition between two of the most gifted players of our generation, will not wane anytime soon. Ronaldo has broken several records while making new ones with his incredible goalscoring and assists for Real Madrid and Portugal. Ronaldo may not have a good record in El Clasico against Messi (10 wins vs 16 wins), but he's the joint-record holder for most goals by a Real Madrid player in El Clasico. Ronaldo has scored 18 goals in El Clasicos in all competitions, joint-highest with Real Madrid legend Alfredo Di Stéfano for most goals scored for Real Madrid in El Clasico. Ronaldo has nine goals in La Liga, five in Copa del Rey, and four in the Super Cup, while Di Stefano scored 14 in the league, and two apiece in the other two competitions. Messi holds the record for most goals in the El Clasico with 26 goals in all competitions.